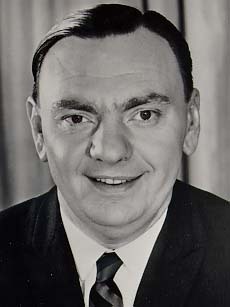 Don Jamieson's entry to broadcasting station proprietorship was preceded by several years as a news reporter and commentator that followed his war-time service. In 1945. he became the first Newfoundlander to sit in the Press Gallery at Ottawa, from which he reported and commented on the negotiations that in 1949 created the Province of Newfoundland. In 1951, in partnership with Geoff W. Stirling, a licence was obtained for a new radio station in St. John's which led to the establishment of stations in Grand Bank, Grand Falls and Harbour Grace, and in 1955 of CJON-TV. In 1961, after serving on the Board of Directors of the Canadian Association of Broadcasters, Don was elected President - a post he held with distinction for four consecutive years. In 1966, he left broadcasting for politics and was elected as a Liberal member of Parliament, and named to a number of House of Commons committees. In July 1968, Donald Jamieson was appointed Minister of Defence Production. Subseqently, in May of 1969, he was appointed Minister of Transport. In November 1972, he became Minister of Regional Economic Expansion. 1975 found him the Minister of Industry, Trade and Commerce. In 1976, the Prime Minister appointed him Secretary of State for External Affairs. In 1979, Don Jamieson resigned his seat in the House of Commons. Following the return to power of the Liberal government, he was appointed at the age of 51 to the post of High Commissioner to London. On completing his term in London, Don Jamieson returned to private life in Newfoundland. His partnership with Geoff Stirling had been dissolved, and he obtained ownership of the group of AM stations that they had established together. In 1986, Don Jamieson died as the result of a heart attack. In the same year, he was inducted into the CAB Broadcast Hall of Fame.